Play Is It True with today's guest April L Wood, author of Winter's Curse, an urban fantasy. This is a game in which authors answer yes and no questions. They can elaborate on answers as much as they choose. When High Priestess Iris Rose-Thorne bets her granddaughter's womb in a broom flying contest–and loses, Winter wonders where the real danger lies: from the Witch Hunters she fled from the far North or her shady grandmother. She finds safety with Turmeric of the Wormwood clan. His eagerness to protect her warms her frozen heart. But her love for him defies the Segregation Curse of Old, cast by the Elders to preserve ancient clan bloodlines. Can they find a way around the Segregation Curse of Old to be together? And with time running out as the Winter Solstice nears, will Winter be able to reverse the curse on her womb? Or will she agree to her fate and remain barren? Yes, Winter's Curse is my debut novel. 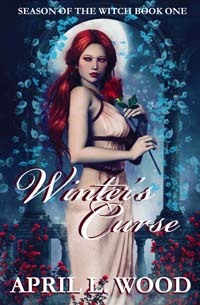 Yes, Winter's Curse is the first installment in the Season of the Witch book series. Yes, I did a lot of research on Wicca. Yes, Winter's Curse is a young adult, urban fantasy novel. Yes. I grew up in New England. I haven't strayed much. Yes, one of my faves. No, I've never had it. Doesn't interest me. April is a debut author, book blogger for A Well Read Woman Blog, an author interviewer, a professional beta reader, and a caffeinated book reviewer. When she is not glued to her computer or pressing her nose in a book, she is busy obsessing over her gardens to the point of insanity, feeding wildlife, and propagating her ever-growing collection of African violets. She lives in a beautiful historic Tudor-Colonial filled to the brim with her family, two cats, and three dogs. Very happy to have you here. :) I shared this on Pinterest, G+, Facebook, and Twitter.